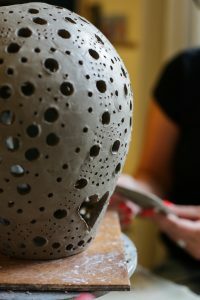 I have experienced the therapeutic nature of clay and pottery in 1993 for the first time. There and at that very moment it was a life-saving experience. 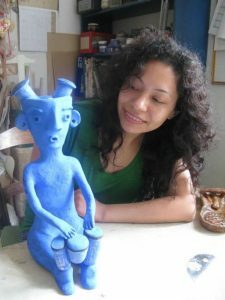 My repressed and trapped creativity had already manifested itself with psychosomatic symptoms when I touched clay again. 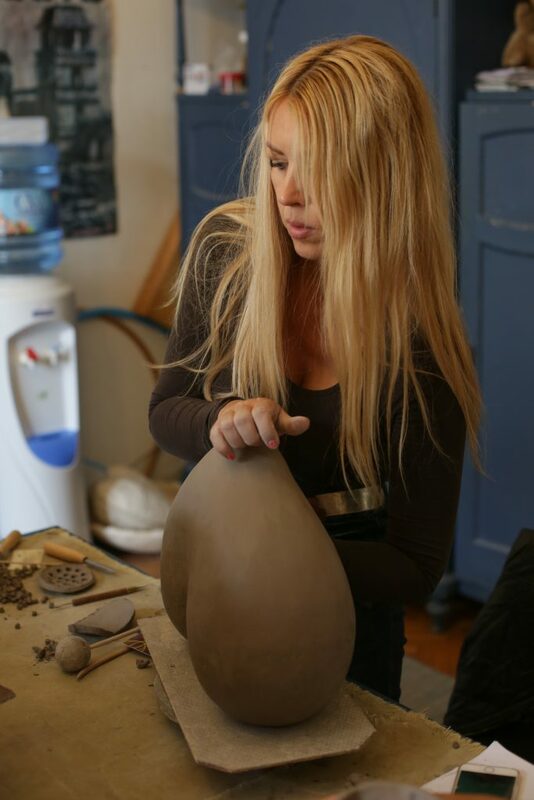 Two years later I opened my own pottery art workshop to share this knowledge and inspiring experience of creativity. The essence of this activity is not the product itself but the process leading to it. Our relation to the matter, clay in this case, reveals our inner, most concealed feelings and fears, which surface and find remedy by revelation. Our inner pictures exteriorize from the unconscious to the healing levels of consciousness creating thus a remedial balance, the consequence being not only newly gained self-confidence, but also a more balanced life originating from a better knowledge of one’s self. 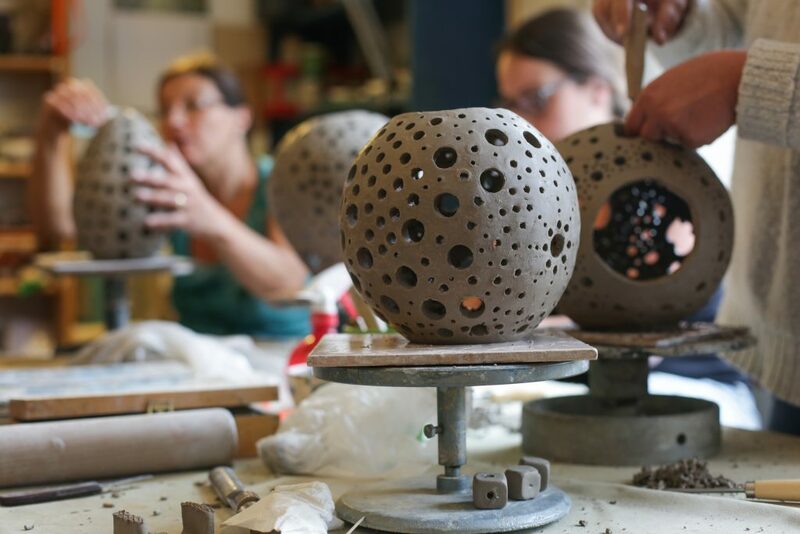 The process of creating reveals hidden talents, creativity and the touch of clay, the shaping thereof builds up a state of soothing meditation. Creating something opens up a new dimension in one’s life that is free from the monotony of daily routine and that of negative feelings and impulses. 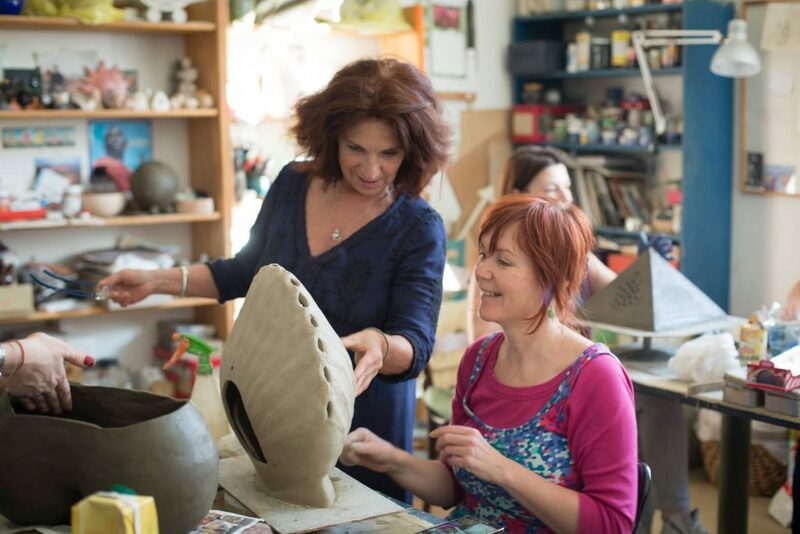 Working with clay makes it possible for us to calmly distance ourselves from problems, and see them from a different perspective. By being intuitive we connect with the universe and the feeling of wholeness which creates our own inner, most private art. It often happens that strange shapes surface from someone’s work that later turn out to be symbols and motifs surfacing from our hidden, unconscious mind and carry important messages to be deciphered. The impact of the created objects, byproducts in fact, is immense. Our self-confidence comes with the process and many times surprise ourselves with our creativity. The I-have-no-talent-and-knew-that-it’s-not-gonna-work attitude vanishes in a moment when you let it conquer you. Only when you admire or use the products of your own creativity at home will you realize the huge difference between the bought items and the ones created by you – with all their perfections and imperfections. Femininity and the strengthening of feminine energies have always been very important, and now that we are more and more liable to change gender roles it is even more so. Women are the ones who create a warm, beautiful and homey environment. Due to the shift in gender roles however women’s self-confidence is often lost or they are simply forced to shift to the “other” side. Creativity and creative work can bring out these inner feminine instincts that are so often oppressed by social norms and pressing social demands. Men are affected by this phenomenon as well, in the other direction. They might feel that they are losing their privileges earlier provided by a patriarchal social structure. Power relations change, they become frustrated and try to compensate for the loss. Often they withdraw or react aggressively to the changes that occur thus instigating more tension. To recover the lost balance men would also need means to discover or re-discover their own creative, more gentile self, art therapy thus being and ideal tool for men as well. It is important to mention that I do not use a wheel when working with clay. I work freely with ancient Native American techniques, skills acquired during my travels for 11 years in South –America. 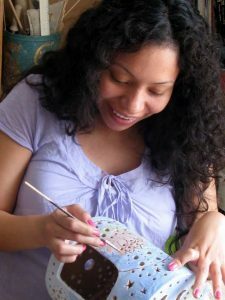 My goal is to make the process “engine free”, to make way for untamed, intuitive art. This technique makes it possible for everyone to work even at home, alone when needing some moments of tranquility. 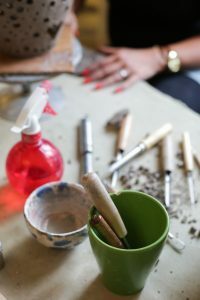 My art therapy workshops, just like the old cotton-mill gatherings, are open get-togethers with chats about everyday issues and problems, good and bad experiences that bring us together. I am waiting for everyone willing to discover their own wonderful self via discovering ancient techniques and the magic of creation.